Thank you Zarcon and Gedd for that information. 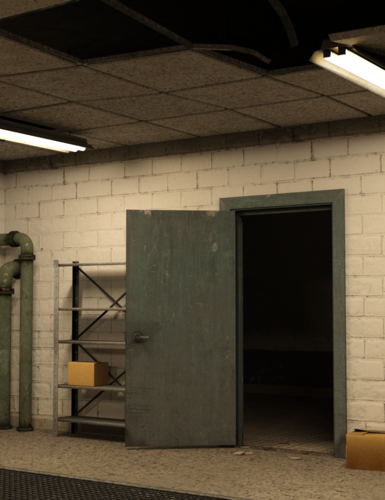 The more I experiment though, the more I find I can get away with all of the same fakery and eyeballing of lighting that I can with 3Delight, as I'm not trying to make photorealistic renders or fool anyone. Drop in an HDR, maybe a off-screen panel for a key light effect and get the thing to Photoshop for the serious work. :) Whether I can postwork it well enough to my liking is something I don't know quite yet, but it's fun. I'm stumped on hair. Specifically, the scalp. No matter what I try fiddling with, such as the cutout opacity, etc. I seem to get a solid blob of color instead of an actual transparency value. If anyone has a quick pointer, I'd be grateful. Edit: D'oh! I finally found the "Iray and Hair" thread. I'll try some of those ideas out. I had really nice results if I make a G2 figure with optimized skin applied, and jotted down values. Then with my 'real' figure, I convert the surfaces to Iray Base, and tweak. Among other things, a lot of surfaces got turned to 'thin walled' when that needs to be off to get SSS effects. 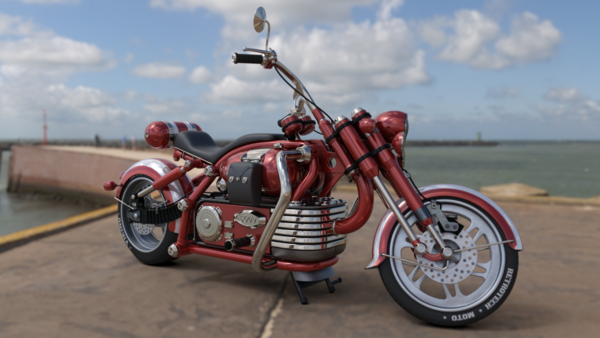 shame the HDRI backgrounds don't react to DOF as it should, notice the ground under the bike and in front. Do you have to wait till the render is completely finished? Even tho after a certain stage it doesn't get any better? I was sure there was a way - like in Reality, I think - where you can save the image without it actually completing. well, if it is in that preview-window thing, instead of straight to file. straight to file, I don't know. Render in window thing. you can just hit cancel on the progress window (Not the preview window). then it should stop, and let you do as you wish with the preview window. Just like progressive render with 3delight. Big window with pic on left (Preview window), Small window with progress bar on the right, hit cancel there. What is a good base/starting intensity for using an outdoor HDR in the environment mat on an outdoor scene? She proposes 0.005 for intensity. I think you'll have to experiment a bit, it will also depend on the HDRI you're using. I tried some of mine, but never had to lower the intensity. It's going to render through the camera you're looking through when you hit render. I always wondered about this; if I'm using a side-by-side video, or a 4-viewport view, how do I know which one is going to render if I hit Cmd-R, or click the render button? More lights, seriously, in general adding more lights does not increase render time. Increasing the render quality setting, may help, but will increase render time. There is also a firefly filter, which significantly increases render times. You can also render at twice size, and reducing it using resampling, like in Photoshop, IRFanview, etc. can also reduce or remove them, some increase in render time but not much. No longer in the tool settings pane. It makes more sense in the draw settings pane, now that we have enough to have a draw settings pane. :) Which is better IMHO. I am really liking what you guys have done with DS. Tip: don't get too nutso using SubD. I upgraded my hardware, worked on a render with two figures, set a lot of stuff to SubD 3... yeeeeah. Machine choked. Is there a specific or best size ? Turn on Finite Sphere W/Ground and you will get scaling controls for the dome. ...so if you just won the big Powerball or MegaMillions and happen to have 800,000$ (the price for 16 VCAs) burning a hole in your pocket, you too can get almost instantaneous realtime rendering. ...yeah,the default layout was kind of strange at first but as I got used to it I've come to like it a lot. Especially nice when having to switch a lot between Camera, Materials, and Preferences tabs. Wait, so if I turn off the firefly filter, it'll go significantly FASTER? Hmmm... I'll have to try this. By the way, I'm rendering a random old PT Cruiser model in a garage for my wife, and it's frickin' fantastic. This renderer must be absolutely DESIGNED for cars, it loves rendering them SO much. I'm finding it very easy to end up way overexposed if you aren't careful. Also I really hope I finish this one pic soon -- it's been four days of tweaks, discovering stuff clipping, etc. ugh. I strongly suspect you are better off shutting off the firefly filter, staying at render quality 1, and rendering at 2 or 4x normal size, then reducing it in post. Edit: Preliminary, going from Render quality 3/Firefly on to Render quality 1/Firefly off, 10x as fast. Sooo... yeah. Fingers crossed. For doing small test renders say 400 x 520 pixels, in CPU only mode. it just dose not make much of a measurable impact. OptiX Accel (Off) instance Optimization (Speed), Max Samples 1000. Nothing else touched except the Firefly filter. Also, with the filter off, it looks like some surfaces are altered in appearance. The SSS shaders are brighter. That's a really fun link, at least for folks comfortable with coding, with a cool MDL material developed bit by bit. From what I can find online (and it's very confusing) a typical candle either gives off a luminance value of 1 or 12.6. As I make fantasy images...does anyone have any suggestions as to how to keep things from being absolutely pitch black once the sun goes down? Realism is all well and good, but I could put fifty candles at 12.6 in a tavern and the patrons wouldn't be able to see the food in front of their faces. I also set the Exposure value to 6, which is apparently within the range of indoor lighting. Not sure what else to try now. edit: setting Exposure to 0 and the lights to 12.6 gives a little more of what I'd expect from candle light - still very dark, but it's not totally black. Our eyes adjust to dimmer light. To get the render engine to do that, kick up the ISO to a much higher degree. It will simulate what our eyes would do in low light situations. - Aperture: it's like the pupil of the eye. The more higher f number, it is more closed. Think in a pupil that is very small, it leaves less light enter into the eye, but it focuses better. The lower f number, the aperture is higher, the pupil is bigger. The background may look blurry, the subject focused, but the light on the scene is higher too. To get more light: increase ISO, decrease the f number (= more aperture). The comparison of the aperture to pupil of the eye is common but misleading in my opinion. In actual use, Aperture is used specifically to control depth of field. Adjusting ISO is actually used to mimic eyes adjusting to various light levels. That is what IES is attempting to address. ISO 400, f/stop 4, shutter speed 60 (I fudged all that too) Architectural sampler on.